On this page are just a few of the many types of milkweed available to plant in your garden. Of the number of types to choose from, some more ornamental than others, yet all provide food for baby butterflies in need of a good meal. Monarchs seem to have preferences though. The plant above with the two Monarchs is Swamp Milkweed (Asclepias incarnata), and it transplants easily. It grows well in ditches with water, or along the edge of ponds, as well as in gardens with regular watering. It has smooth leaves and is a preferred plant for the moms to lay their eggs on. 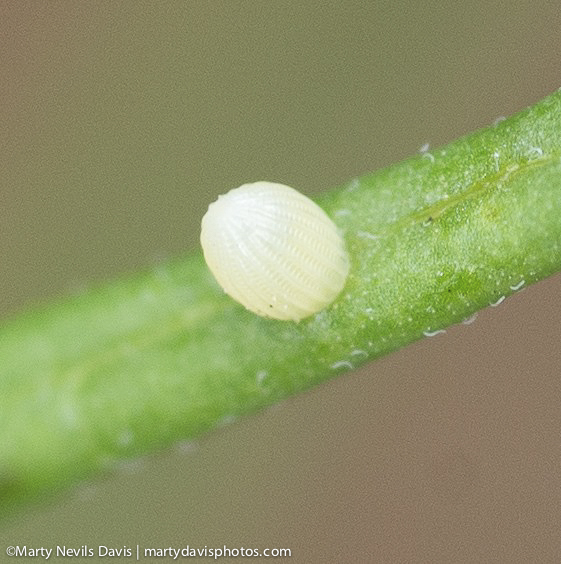 They often choose to lay their eggs in the unopened buds (as seen on my egg page), then later on the undersides of the leaves. The plants at the very top (banner image) and to the right are Common Milkweed (Asclepias syriaca), another highly preferred milkweed for monarch moms to lay eggs on. Common Milkweed is the most prevalent milkweed in the midwestern and northeastern U.S., and the most frequently used host plant for monarch larvae. Lab analyses of Monarch tissues revealed that the majority of monarchs overwintering in Mexico fed on Common Milkweed as caterpillars. Habitat destruction of this valuable plant is a great threat to future monarch populations. Common milkweed has a tap root which makes it more difficult to transplant, but it's a wonderful plant and can be grown from seed or plants can be purchased. Below the Common Milkweed is Tropical Milkweed (Asclepias curassavica), which grows as a perennial plant in the south and as an annual plant in the north. It starts well from seed and features red and yellow flowers. Monarchs love this plant. It's gotten criticism lately because of how it appears to alter the migration in the southern states. I've heard the best thing for those in the south is to cut Tropical milkweed to the ground in the fall. The milkweed at the bottom right with the heart-shaped leaves is Sand Vine Milkweed (Cynanchum laeve), which grows as a perennial vine and can be quite invasive. I often see it growing in fields and in trees or on fences, etc. I witnessed a monarch mom laying eggs on this plant with an abundant amount of Common Milkweed growing right next to it. Because it's a vine, it's really hard to look for eggs on the underside of the leaves. Beneath the Sand Vine is Whorled Milkweed (Asclepias verticillata), with it's super skinny leaves (like pine needles). Its leaves look nothing like any other milkweeds and can be easily missed when growing in the wild. You can identify it as milkweed for sure by its white flowers which are identical in shape to the other milkweed blossoms. (Can you see the Monarch egg in the top photo of Whorled Milkweed?) I was surprised to witness monarchs lay eggs on this plant, even with Common, Swamp, and Tropical milkweeds nearby. Whorled Milkweed is one of the more toxic milkweed species and may be avoided by monarch moms. Read about more important and interesting characteristics of a variety of milkweeds in this article by the xerces society. You can also read lots of interesting milkweed facts here, including the use of milkweed for medicine and human consumption. Milkweeds belong to the family Asclepiadaceae, derived from Asklepios, the Greek god of medicine and healing. Unfortunately, milkweed is being destroyed at an alarming rate. It's my great hope and desire that as people learn about the fabulous monarch butterfly they'll plant milkweed in many places, beginning in their own yards. It's really up to us, those who love this butterfly, to preserve, protect, and create the habitat the monarch butterfly needs to survive. 'We're developing this country at a very rapid pace with very little attention to wildlife,' Taylor said. 'In addition, the widespread use of herbicides along roadsides, transgenic crops and expansion into biofuels is reducing habitats for wildlife. These sorts of losses have to be dealt with if we're going to sustain this monarch population. We have to create new habitats and we have to protect the habitats we have." These comments present a very compelling reason to plant a lot of milkweed. Milkweed plants for monarch larvae to eat must be untreated with chemicals in order to not poison and kill them. Some of the worst pesticides used commercially and around homes these days are called neonicotinoids, or neonics, because they're systemic and they stay around in the plants and dirt for a couple of years. They not only kill caterpillars who eat the affected leaves, but neonics also affect the plant's nectar and pollen, poisoning pollinators feeding on the plant's nectar. It's an impact most would never suspect. Many believe that these pesticides are responsible for the huge decline in Monarch butterflies, honey bees, and bumble bees. You can read more about how these toxic pesticides impact Monarchs here and here. It's important to feed your caterpillars and butterflies chemical-free, "safe" milkweed, as well as providing safe nectar plants for the adults. September 10 & 17, 2016 - Eco Logic Nursery, 8685 W. Vernal Pike, Bloomington, IN. For more info: follow them on Facebook or their website. Eco Logic staff noted that they have treated their milkweeds with non-systemic chemicals to control aphids but have suspended this for the fall to allow monarchs to eat and complete their metamorphosis. Held annually at Geist Nursery, 9890 Mollenkopf Road, Fishers, IN. Takes pre-orders in March. For more info: george@nativeplantsunlimited.com or their website. Held annually on the third weekend in April in the Newfield house, across from the LOVE sculpture on the museum grounds. For more info visit their website. Held annually in early May in Mounds State Park in Anderson, IN. For more info follow the park on Facebook see their website. State Park admission required. May 7, 2017 - The Indiana Native Plant and Wildflower Society holds their annual native plant sale at Park Tudor School, 7200 N. College Ave., Indianapolis, IN. For more info: plantsale@inpaws.org or their website. May 20, 2017 from 8 a.m.-3 p.m. at the Hamilton County 4-H Fairgrounds (Exhibit Hall), located at 2003 Pleasant St., Noblesville, IN. Types of milkweed sold: Common, Tropical, Swamp, Showy, and Butterfly Weed. In 2015 they sold approximately 400 milkweed plants. For more info: PlantSale@hcmga.or or their website. Do you know the name of the popular butterfly pictured here? Is it a male or a female? You can find out here! Unlike the Monarch caterpillars who only eat milkweed, the caterpillars for this butterfly eat the leaves of Yellow Poplar, Black Willow, Black Cherry, American Hornbeam, Red Maple, Spicebush, American Elm, and Sassafras trees! Gardens With Wings is a good website that can help you identify other butterflies and caterpillars which live in your area. Just enter your zip code. It includes native host and nectar plants needed to attract Monarchs, as well as all kinds of butterflies. MILKWEED (Asclepias) is a food source (nectar) for all butterflies (and bees), but it's especially valuable for the monarch because it's also the only host plant for their caterpillars. There are approximately 110 species of milkweed in North America. This perennial wildflower is the only "host" plant, or food source, for the monarch larva. Quite simply, without milkweed we will not have monarch butterflies. It's because of this one fact alone that we need to give milkweed our utmost respect. There are many good sources for milkweed seeds and plants; it's just very important to know if the plants have been treated chemically in any way, as it will most likely poison and kill the caterpillars. (See the info below about where to purchase chemical-free milkweed plants and seeds.) Some milkweeds can be transplanted very easily and others are a challenge if you plan to dig them up to move them from a field to your yard, etc. If your caterpillar begins to vomit lime green liquid all over the leaves and container, it's been poisoned by chemicals on or in the milkweed. Change the food immediately to chemical-free leaves. One time this happened to my caterpillars and most recovered but some died. Another time they all died. Also, do not handle flea and tick treatments for animals and then handle anything related to butterflies. It will kill them all. Monarch caterpillar blood is also lime green, but I've read that if it's blood it will turn black within ten minutes. Caterpillar vomit never changes color. Always wash your milkweed leaves, but please note that it's not a guarantee that it will make your milkweed safe. I gathered leaves from plants which had gone through an inch of rain and a double washing in my house and the the caterpillars still became very ill and died. milkweed is a toxic plant! Milkweed itself is a plant toxic to most creatures who eat it, but not as much for Monarch butterfly larvae. The plant sequesters a chemical called cardenolides, or or cardiac glycosides, which are steroids that impact the heart. It has been known to sicken and even kill sheep and cattle who have eaten milkweed in open range grazing or if it was mixed into their feed or hay. Symptoms of livestock poisoning include profound depression, weakness, labored breathing, and seizures. Monarch caterpillars have learned how to tolerate this toxic chemical, but the milkweeds with the greatest amounts of cardenolides may also make them sick or even kill them. Some evidence has been found that Monarch moms laying eggs will choose milkweeds with a lower level of cardenolides. As mentioned earlier, Whorled Milkweed (Asclepias verticillata), is one of the most toxic species. A monarch caterpillar feeding on a toxic plant makes for a toxic meal for a predator, offering it protection from many but not all. Because of the chemicals the larvae ingests it will become a very distasteful and toxic butterfly. (You can read more about these toxins here.) Thus the orange coloration warning for predators to not eat them. There are still, however, plenty of predators who eat monarch eggs, larvae, and butterflies. On milkweed, there are spiders, beetles, ladybugs, ants, etc., who will eat the eggs and/or caterpillars. Some birds and mice even know how to eat the butterflies without consuming toxins. Surprisingly, people eat milkweed too, but it must be prepared carefully to be safe. Milkweed latex or sap is the very sticky white substance that oozes and drips from broken leaves and stems of milkweed plants and is what gives milkweed its name. For the most part, a Monarch caterpillar can eat the latex without it gumming up their strong jaws, but not always. Sometimes tiny caterpillars die. You may notice that the smallest caterpillars will eat a half-circle around themselves and then eat the milkweed. This is called "trenching" and it's done to stop the flow of the sticky latex to that part of the leaf. Large caterpillars will often bite a "notch" into the spine of a leaf for the same reason. For humans, it can be dangerous to get milkweed latex into eyes, and emergency medical care should be sought if that happens. Symptoms may include pain, itching, watery eyes and blurry vision that can last several days. You can read some first-hand reports here. Milkweed latex can also be a skin irritant, and it was even used by the native Americans to remove warts. Disposable gloves are helpful when handling leaves and stems. When collecting milkweed for food for caterpillars, some monarch enthusiasts have reported that less sap oozes from plants and leaves collected early in the morning or after sunset. I don't know if you can ever have enough milkweed to feed the troops!